Cut Waitrose Gourmet Baby Beetroot into quarters, drizzle with olive oil and crushed dry-roasted coriander seeds and roast in a hot oven until hot and tender. Meanwhile, season a trimmed piece of monkfish fillet, brush with olive oil and fry in a hot pan until browned on both sides and cooked through. 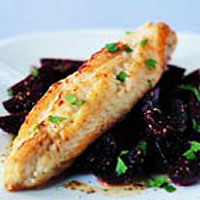 Serve with the beetroot, sprinkled with roughly chopped fresh coriander and drizzled with a little fresh orange juice. This recipe was first published in Tue Jun 01 01:00:00 BST 2004.